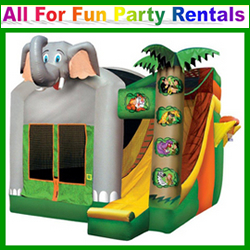 Rentals of inflatable bounce houses, wet/dry slides, and obstacle courses for parties and events. Party rentals including, inflatables, sumo wrestling, pitchburst, spin art, candy art and much more. Big Bright Bounces specializing in inflatable moonbounce rentals, Large rental selection of bounces, slides/mazes,interactive playand more. Boing! is a party rental company specializing in moon bounces, bounce and slide combos, water slides, dunk tanks & fun food machines. Indoor inflatable amusement park with private party rooms, off site rentals, open bounce every day all at most affordable rates in the industry. Come Play! Moonwalk rentals for birthday parties, day care events, fund raisers even chur and company picnics. Add a Pennsylvania Bounce Business! Advertise your Pennsylvania bounce house business in this inflatable rentals resource and have your Pennsylvania inflatables business information appear across multiple Children's Party and Kids Event rental websites. Bounce House Guide is the most complete online resource of Pennsylvania Bounce House Rental information. Find a Pennsylvania Bounce House For Rent, Themed Bounce Houses, search for Moonwalks, Jumping Castles, Pennsylvania Inflatables, Obstacle Courses, Sumo Suits, Bungy Trampolines, Jousting, Pennsylvania Giant Slides, Water Slides, Party Rentals, Carnival Games, Concessions, Fun Food, Dunk Tanks, Table and Chair Rentals, Photo Booths, Pennsylvania Festival Rentals, Pennsylvania Event Rentals, and more! Do you own a Pennsylvania Blowup Moonwalk Business? We also feature HOT ways to advertise and market your Pennsylvania Bouncey House Business. Add a Pennsylvania Bounce House Business or take advantage of our Premium Bounce Advertising & Featured Listings. Buy or Sell Equipment in the Inflatables Classifieds. Promote your Pennsylvania inflatable business with Blowup Moonwalk Marketing Products, browse the Bounce House Blog, follow Bounce House Social Media on facebook Blowup Moonwalk Rentals or twitter Blowup Moonwalk Rentals, discover multi-site marketing with the Kids Party Resource Network, or Advertise a Pennsylvania Bounce House Business For Sale.